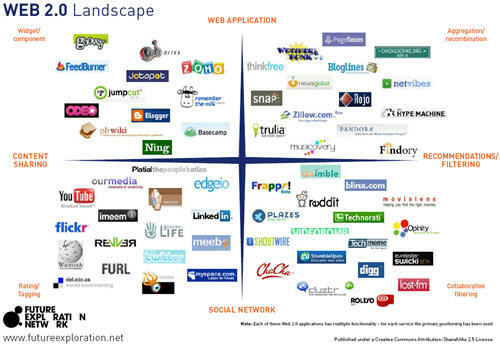 Web 2.0 is the evolution of Web 1.0. It is a new usage of the internet since 2004. It is the collaboration on the World Wide Web (WWW) that works with web applications, which further the information sharing on web, increases interaction through the web and user-centered design. Typical example would be Wiki. Web 2.0’s data federation requires a very strong and high supportive from data base and work-flow. It allows user to interact with more flexibility with other users through the web and users may also have opportunity to change the content of websites as the way they wish. Web 2.0 allows users to interact more in the web and interact in terms of content and material available on the web. For example as a web user we don't have to rely on media organizations to provide us with the kind of information we need, as user's we are free to upload our own experiences on the world wide web and look for stories which are of interest to us as we overlook the closed view point of the media organizations. Web 2.0 is all about internet communities that are a revolutionary way of organizing global societies. There is a shift from the old power houses to a system of collective collaborations on the web which have brought about social convergence that is bottom up. There is a shift on political economy which has been expanded and exploited by the long tail functions on some internet sites that have defied the old economic law of demand and supply. Whereas Web 1.0 was focused on providing text as a source of information like a library of some sort, Web 2.0 is multi-media platform that provides applications for users to participate by watching, discussing, coordinating and collaborating as a way of interacting in a larger community. Web 2.0 provides a place of participatory social actions achieved through adding applications and information as experienced in wikis but Web 1.0 was page oriented and there was no access for users to make any changes. This was mainly because the web pages were propriety to individuals and organizations. Web 1.0 had many restrictions and boundaries that made it very predictable but with Web 2.0 we have no control over what is being developed we are currently living in a revolution that might shift to Web 3.0. One of the primary differences between Web 2.0 and Web 3.0 is the way words are used in search engine functions. Web 2.0 uses syntax, which focuses on keywords, while Web 3.0 uses semantics, which expands on keywords and considers the search in terms of meaning and context. Flickr is a photo and video sharing website. People upload photos and videos to the website so that not only the person himself, but also everyone who uses flickr can see the photos and videos. These photos/videos can be embedded into blogs. Furthermore, people can respond to the uploaded photos/videos. They have online communities where people can communicate with each other more effectively. As it states on their website, the two main goals of flickr is to “help people make their content available to the people who matter to them” and “to enable new ways of organizing photos and video.” Flickr is a dynamic platform where live interaction and collaboration take place among its users. It is very different from Ofoto, an online photography service which was started in 1999, and “started by simply allowing users to upload JPEG images to the online service, to share online photo albums with friends, and to purchase physical silver-halide prints of photos.” Flickr is much more dynamic and interactive than Ofoto. Britannica Online is like an online version of Britannica. Again, just like flickr and Ofoto.Britannica contains hundreds of thousands of articles, biographies, videos, images, and web sites. ; however it is not as interactive and collaborative as Wikipedia. Wikipedia allows its users to edit an entry at anytime, anyplace. Frequent updates and high accuracies are ensured this way. The term is initially introduced in 2004. Although the term suggests a new version of the World Wide Web, it does not refer to an update to any technical specifications, but rather to cumulative changes in the ways software developers and end-users use the Web. Web 2.0 sites provide users with information storage, creation, and dissemination capabilities that were not possible in the environment now known as "Web 1.0".The popularity of the term Web 2.0, along with the increasing use of blogs, wikis, and social networking technologies, has led many in academia and business to coin a flurry of 2.0s. On the contrary as much as Web 2.0 is a social revolution in the information and communication technology, there's a downside to it; according to Kevin Kelly, the web is allowing a lot of sharing but we should be careful what we are sharing on the internet because once the content is out there it cannot be removed. This would support the allegations by most social network site users who claim that even when they have deleted their profiles their information is still available on the internet.